Ever since the kids were babies, we've gone apple picking every year. What was once a fairly rural experience has now become a bit of a circus as the apple orchard has added different attractions for people coming from the big city and all around. It's crowded, there are lines, and one has to weave and dodge the milling families and couples. Still, it's tradition to get our apple picking bag, board the tractor-pulled wagon and make our way up the steep hills that lead to whatever section of the orchard that has apples ready to be picked. This year we were there for the Cameos, Sun Crisp, and Mutsu apples. The Mutsu apples were huge and recommended for use in pies, although they are also superb eating apples -- I think the best of all I've tried. Well, we did use some of the Mutsus for apple pie. And since I had some leftover homemade puff pastry from a Daring Cooks challenge, I decided to also make some apple turnovers. If you follow this blog, you know I'm not much of a baker. Before I started this blog, I would call myself a non-baker. However, since I joined the Daring Bakers and have baked beyond my comfort zone, I am slowly getting better. I've also realized that, like cooking, you can wing it in baking once you know the rules. 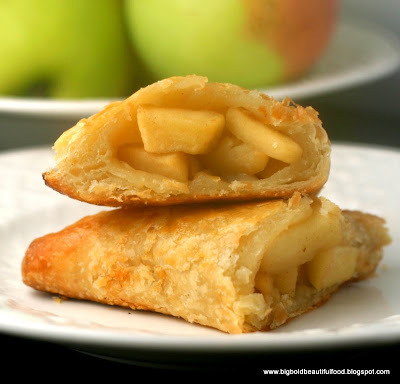 With the turnover filling, I just sauted 2 diced apples in a little butter, sprinkled apple pie spice, and about 1/2 cup of a mixture of brown and white sugars, and added a shot of lemon juice. Apples are going to be at different levels of tartness, so if you have sweet apples, you'll use less sugar and vice versa. If your resulting filling is seasoned enough so it can hold its own with the puff pastry, then its good to go. I rolled out my puff pastry 5 by 5 inch squares, added some filling in the middles, and brushed the edges with egg wash to help hold the seal. I folded the edges over to make triangles and then crimped the edges with a fork. I brushed the triangles with the egg wash and then cooked them in a 400 degree oven until puffed and lightly browned, about 20 minutes. 1) Any great baking apple, like Granny Smiths or Macintosh apples, will work here. 2) Raisins, nuts, and other additions would work well in the filling. Of course, the world is your oyster with the filling, which would be anything, sweet or savory. 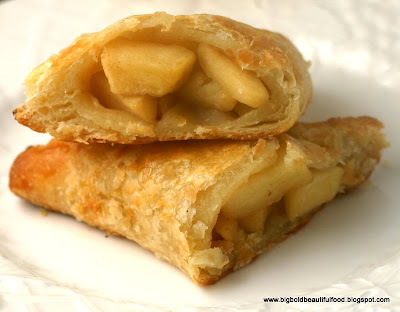 3) Because puff pastry cooks quickly, I pre-cooked the filling to make sure the apples were soft. 4) If you are looking for a more precise recipe, I found this one at elise.com. They look delicious..don't say you are not much of a baker! :) When my daughters were little the only turnovers I made were Pillsburys!! Imagine..Yours ..to me..look perfect! Looks like a perfect turnover - flaky and delicious! They look really yummy. I love apples in baking. You are a baker now! :)) I am so glad. Looking forward to more bakes from you Ninette! You are loving your puff!! I love making apple turnover. so easy and delicious!!! I've never heard of the mutsu apple and not sure if we get it in Australia - you're lucky to be able to access such produce there and go apple picking. How fun!